Create your dream website in days without breaking the bank! If you want to create a beautiful, functional and profitable online home for your business by yourself, this is your dream website and blog design template. I still see business owners with gmail or hotmail accounts and no personal or business website. First impressions do matter and you CAN afford to look like an expert right from the start. This course will help you create a beautiful online home in just days! Your website is your business home online and yes, it can be easy peasy to create your dream home. Turn your site visitors into potential clients by drawing them in with a well-structured, customer friendly and professional looking website. This tutorial will allow you to have a beautiful online presence which is strategically designed to magnet clients so you can grow your business into a successful blooming venture. Get a beautiful professional looking website in days without breaking the bank. The Website and Blog Template is for the entrepreneur, business owner, consultant or educator who wants a step-by-step guide to creating a website that has been strategically designed to bring in more sales! A Coming Soon Page so you can start to build a list of potential clients while you finish your website. A mood board to help style your website. A fully-functional website which includes Home, About, Services, and more! Learn how to style your website using valuable tips and tricks. Create professional graphics for free. Launch your new business home in just days! 16 lessons will guide you through the entire process. This is a hand held process and suitable for people with no prior experience of website design or using Squarespace. Ready made graphics and swipe files will allow you to build out your website fast. Professional tips and copy-and-paste CSS code all made easy. + Is this course for you? This course is best for small service businesses, coaches, bloggers, consultants etc. If you require more complex features or navigation for your webiste, this is not for you. + What is included in the package? You will get 16 lessons to walk you through creating a Mood Board and then a stunning website in just days or less! You will be using graphics, text and swipe files provided as part of the package. You will then be able to customise by replacing with your own content. Your new website will include SEO, Google Analytics, Coming Soon page and more! + How long does it really take to build the whole website? Creating the replica template should take about 2 to 3 days depending on how many hours a day you spend on it. You should aim to spend at least 2 hours per day. Then it takes only a couple of hourse to switch the branding to yours (that is your graphics and texts). + Is this tutorial only for Squarespace? This tutorial is about building a stunning website on Squarespace. Squarespace ticks all the boxes and more. Take it from someone who has tried most of the other platforms out there. 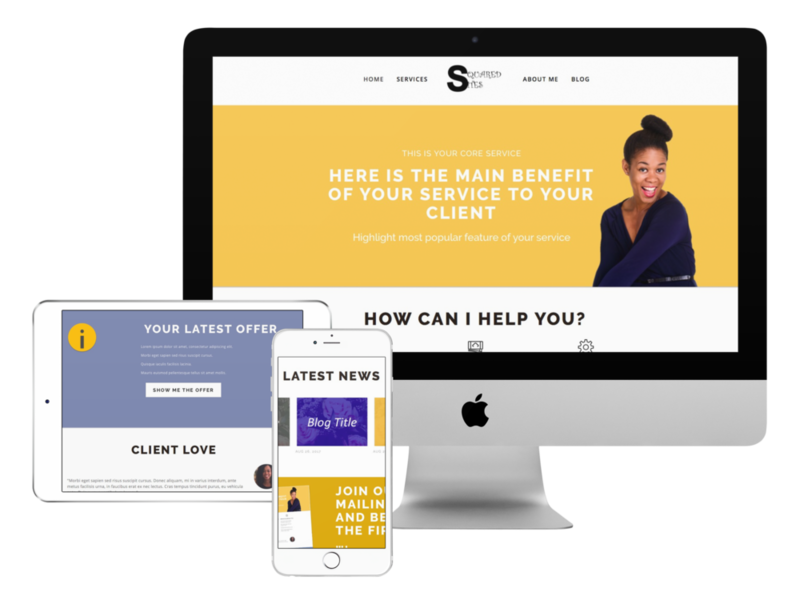 Squarespace is the small business owner's answer to a beautiful platform which sends a clear message without needing any technical skills whatsoever to maintain. It means you will be able to maintain your website after you launch without continously paying me or any other designer to do it. + Why have I created this course? It is my passion to help entrepreneurs get their businesses up and running online. It is so expensive to hire a professional designer and I believe business owners who are on a tighter budget deserve a way to get a stunning website too. This template is designed and successfully tested to attract clients. Due to the instant nature of the product, no refunds are available and all purchases are final. We are always happy to receive feedback to update the course.